A totally up-to-date performance guide to the small block Chevy. 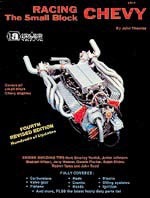 Covers: High performance at a reasonable cost, component blueprinting, revealing cam, carb, head porting and ignition tips from many of racing's best known engine builders, complete assembly specs. plus much more. 330 illustrations. Limited Quantity! Special Price!